Samsung UE48JU7000 review | What Hi-Fi? 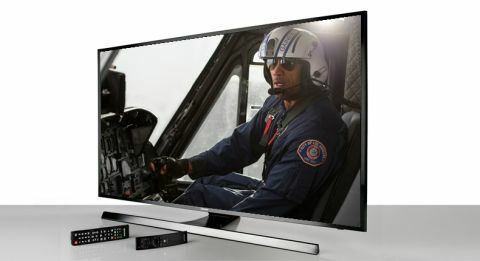 The Samsung UE48JU7000 sits in the middle tier of the Korean company’s Ultra HD range. That means you get over eight million pixels without the need for a second mortgage. We’ve encountered this range before: the UE65JU7000 is this candidate’s big brother, and it impressed us enough to walk away with five stars. Naturally, we expected the same level of success with the more lounge-friendly UE48JU7000, and this TV does not disappoint. What your money gets you is a tempting blend of performance, ease of use, and looks. Samsung’s Tizen operating system is new for 2015, and comes with a few tricks not found in previous generations. It’s similar to LG’s WebOS platform, which means smart hubs are out: you now get a pop-up bar of recent and recommended content. You can switch between live TV, HDMI inputs and apps as you would change channels – no more quitting and rebooting. It’s not as slick as LG’s effort but it’s equipped with Netflix, Amazon and all of the UK’s main catch-up services. Moving on to performance, we begin at the top with 4K content: Daredevil streamed from Netflix. It has plenty of dark scenes that can be a murky mess on lesser displays, but the Samsung does a great job showing off these nocturnal activities. Contrast is excellent, with blacks surprisingly deep for an LED TV. It’s not quite the inky depths of an OLED panel, but it’s certainly dark enough. You won’t have any problems with the black bars top and bottom. Within the darkness there are enough degrees of separation to make out plenty of detail. Meanwhile, whites are bright without washing out their surrounding areas. The colours are expertly judged. You often get muted hues on the show, but the Samsung proves that’s not the same as ‘dull’. Deep reds and blues are vivid enough to stand out but not overblown as they can be in a shop demonstration. It’s a subtle picture. Shading is nicely handled, even in the awkward areas of contours and clothing, and skin tones look entirely natural. It looks like Samsung has bumped the vibrancy up a notch from last year’s sets, which occasionally seemed a little under-saturated. Given the number of pixels in 4K, you’d expect a sharp picture – and that’s what you get. Edges are strongly defined and textures well mapped. But it’s not just the sharpness that counts, and we’re happy to report it’s a wonderfully clear picture. Daredevil’s nemesis likes to stare at walls, and this Samsung has the chops to show off every imperfection in the paintwork. Not watching 4K? This Samsung is a champ with 1080p content too. We put on a Blu-ray of Guardians of the Galaxy, and it’s the same story; impressive clarity, strong contrast and good colours. The level of detail goes down, but the upscaling is very competent indeed. Even in standard definition, the Samsung puts in a brave effort, with minimal noise and solid lines. The Samsung’s audio performance is good too. While we rarely enthuse about flatscreen TV sound, this one does a fine job. It’s weightier than we’d expect, with good tonal balance and an impressive spread, and we’re not compelled to reach for the soundbar at the first opportunity. The Samsung UE48JU7000 is a very strong all-rounder and does plenty right in every department. Want 4K, but don’t want to splash out on a top-end model? This TV does the job very nicely indeed.